What is CFQ Qigong? Find out how it can help you heal. What is CFQ Qigong? It is also know as Meridian Healing. CFQ has a set of movements called the Hexagram and additional movements to help clear blockages from the body. CFQ is a self-healing tool that uses a moving form of meditation. It is also a treatment method for healing others at a body, mind and soul level. CFQ is said to vitalise our tissues, organs, muscles and bones, relieve pain, eliminate stress. Both psychological disabilities and physiological problems are efficiently relieved. By opening out and flushing away the debased energy forces that traumatise, including the head, torso and vital internal organs. The bodies resilience is reactivated and health restored. CFQ Meridian exercises promotes the relaxation of the energy consciousness factor in the healing process. Increasing the meridian’s energy flow that deepens the brain’s state of relaxation with enhanced states of consciousness, well-being and calmness. Practicing CFQ regularly relieves presenting health problems such as frozen shoulder, chronic neck, back, knee and ankle issues. The results can be seen quickly, sometimes after only a few days. Prevalent conditions such as fatigue, insomnia, anxiety/anger outbursts and migraines can also be stopped and the practitioner will be reassured that they won’t regularly recur and be confident they can be controlled by reinforcing the feeling of well-being. The continuing practice of CFQ for periods of 12 months or more can alleviate and remedy conditions that can be seen as persistent such as; Hypertension, Post-Traumatic Stress Disorders (PTSD), low blood pressure, diabetes, depression, obesity and age-related problems. CFQ Meridian Healing promotes the individuals resilience, transforming the energy consciousness to pursue a long and health life. There is plenty of clinical evidence (Yap and Hiew, 2002) available to support the enhanced coping mechanisms and complete recovery from some chronic diseases. First and foremost though CFQ Qigong is the practice of a self-care tool. The tool helps with the stresses and strains of normal living that traumatize mind and body. 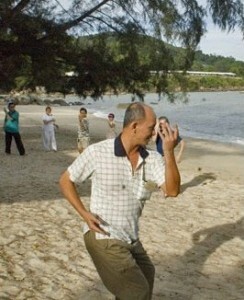 For this to be most effective study with a Qigong practitioner is the best course of action. To discuss how Qigong can help you then call Yvette on 07973 638050 or send a message through the contact form to the right here.